A recent open house for a task force looking at the future of the various police oversight committees heard calls for more transparency and openness when it comes to investigations regarding police conduct. The panel tasked with reviewing Ontario’s police oversight agencies was recently in Oshawa and heard some pretty strong and emotional words about how the trio of organizations currently operate. The public open house at the Civic Recreation Complex saw a group of residents, police association members and members of the Durham Regional Police Services Board attend to share their feedback for the ongoing review of the Special Investigations Unit (SIU), the Office of the Independent Police Review Director (OIPRD), and the Ontario Civilian Police Commission (OCPC). The review was initiated by the province in April when Justice Michael Tulloch was appointed to lead the independent review spurred by the public backlash concerning the SIU investigation and report into the police shooting of Andrew Loku. Loku, a 59-year-old father of five from Sudan was shot to death by police in 2015 in an incident in his apartment hallway. According to reports on the incident, Loku had been involved in an altercation with tenants in the apartment above his own and when police arrived he failed to drop the hammer he was holding. An SIU investigation and ensuing report eventually cleared the officer involved of any wrongdoing. Repeated calls for the release of the SIU report into the incident from the Toronto community and Black Lives Matter were heeded in April when the document was released in a heavily redacted format. 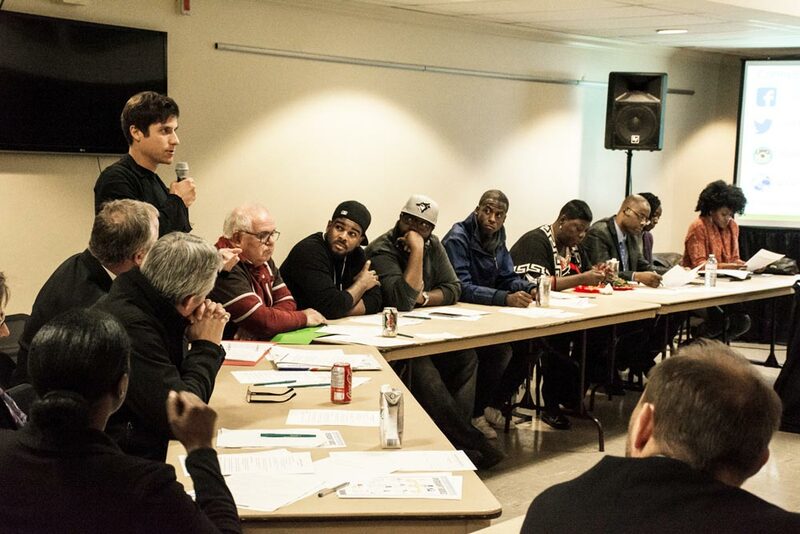 The series of events raised several issues about police oversight in Ontario. “In cases of death, it is always more serious and the public attention is drawn, so how could it be that there was no wrongdoing when a particular individual, a black man, is killed by police? How does that work?” says Pamela Grant, a facilitator and strategic advisor involved with the review. The review was facilitated with a trio of goals in mind for its final recommendations, those being to enhance transparency and accountability of the police oversight bodies, to ensure the three agencies are effective and have clear mandates and reduce any overlap or inefficiencies. The Oshawa session was the 14th of its kind in Ontario that the review has held, along with numerous other sessions with police chiefs, police boards and associations and other stakeholders. Grant says similar concerns have been raised at many of the meetings. “We’re hearing right across the board from all the communities, including the police community, that the three areas we’re focusing on – accountability, transparency and generally efficacy and/or public confidence in the civilian oversight bodies – is that there is a need for more of all of that,” Grant says. At the meeting, Jamie Bramma, a director with the Durham Regional Police Association, had stronger words for the current system. “The current system, right now as it exists, is broken,” he says, mainly pointing to issues with the SIU and the length of its investigations, some of which can take up to a year to complete, something that is onerous on both the victims and the officers involved. The SIU, established in 1990, is responsible for reviewing incidents of police-involved death, serious injury or sexual assault. The OIPRD receives and manages public complaints about police and the OCPC oversees policing services and is an adjudicative body in appeals from police disciplinary decisions while conducting investigations in the conduct of police chiefs, and police services board members. Those in attendance also raised issues around a lack of knowledge concerning the oversight bodies and how they operate, as well as questions around the practices of the collection of race based data, and whether the names of officers involved in SIU investigations should be released publicly. The mandate of the review also includes analyzing whether past SIU reports should be released and whether former police officers should be employed on police oversight bodies. According to Grant, each session is a way to “get a pulse” of how the general public feels in each community, something that is crucial for a process that was created due to a lack of transparency in the Loku case. Oshawa MPP Jennifer French, who is the NDP’s community safety and correctional services critic, was also in attendance at the open house and shared her thoughts on the transparency of the oversight bodies and the need for equal treatment for police and the public. “The fundamentals of justice, I think, have to apply to everyone,” she said. Moving forward, Tulloch will be creating a final report with recommendations to be submitted to the province by the end of March 2017.